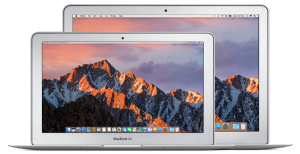 At Mac Repair London, our knowledgeable and highly experienced London MacBook Air repair technicians can troubleshoot any notebook problem whether hardware or software and can fix, service or upgrade all 11.6 inch and 13.3 inch MacBook Air notebook models. Our Apple Mac repair team has the knowledge, experience and tools to quickly diagnose and resolve all your MacBook Air notebook computer problems including lost or forgot your firmware password, MacBook Air is overheating, MacBook Air won’t turn on or start up, screen is blank, MagSafe adapter won’t charge the notebook, laptop battery drains too fast, logic board failure, trackpad isn’t working properly, damaged or cracked screen, slow performance, Mac USB ports stopped working, sound problems, notebook computer won’t shut down and Mac isn’t connecting to WiFi. If you have any questions about our London MacBook Air repair or upgrade services, please feel free to call us at 020 7394 2528 or e-mail at info@mac-repair.london.